I'm one of I'm sure many that's guilty of not always eating right and therefore depriving my body of some of the essential nutrients it needs on a daily basis. Thanks to the makers of Centrum® MultiGummies I am able to help keep that in a little better check. Centrum® MultiGummies have B-vitamins that help support daily energy needs as well as aid in the metabolism of fats, carbohydrates, and proteins. They also have Vitamins C, E and Zinc to help support normal immune function. Now that's whole body health all in two easy to chew, great tasting fruity gummies. I like that these come in a gummy form because I'm not big on swallowing pills, especially multiple pills. I like to take these when I'm getting dressed as part of my morning routine. It makes it easy to remember and easy to do by just popping them in my mouth, no water needed! They have a nice fruity flavor and don't leave a nasty aftertaste in my mouth either which is another big plus. Besides all the healthful benefits of course. Centrum® MultiGummies is a great-tasting, easy-to-take multivitamin supplement designed to provide key nutrients that help support your energy, immunity, and metabolism. Centrum MultiGummies contain three natural flavors: Berry, Cherry, and Orange. These multivitamins are easy to take and include essential nutrients like Vitamins B12, D, and E plus others to support your whole body health. Buy it and save: Click here for a $2 Centrum MultiGummies coupon. 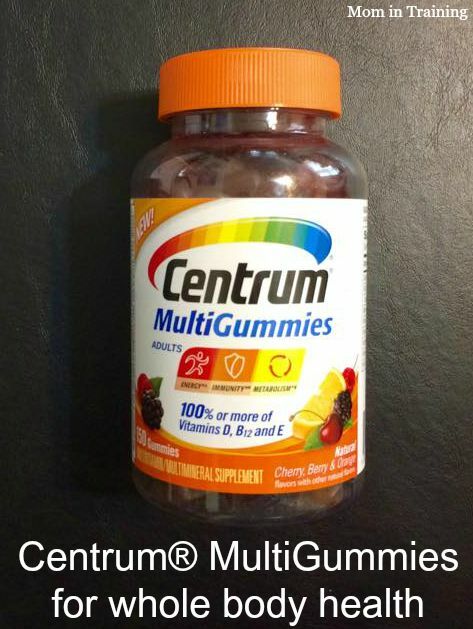 Click here to learn even more about New Centrum MultiGummies. Like Centrum on Facebook to keep up with all of the latest deals and offers. Yeah! It has Inositol in it! I've recently learned about the importance of this "B" vitamin which gets very little press. I've been taking it as an individual supplement for a while now and it has really helped me feel better.